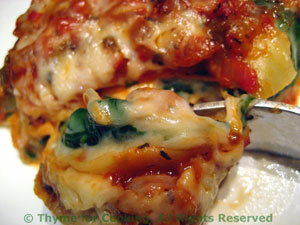 Easy Dinner: Sausage and Spinach Lasagne, Weekly Menu Plan. Have any leftovers for another meal, lunch or freeze for later.. This is a hearty lasagne, a bit more familiar, but with a few flavor twists: fresh spinach, sausage and a bit of green pepper. Using no-cook noodles makes it all easy. Heat the oil in a large skillet over medium heat. Add onion, pepper, garlic and sauté for 10 minutes or until tender. Slice sausages as thinly as possible (less than 1/2", 1cm) and add to skillet. Sauté until cooked through. Drain whole tomatoes, reserving sauce, and roughly chop. Add to skillet along with tomato sauce, reserved sauce and herbs. 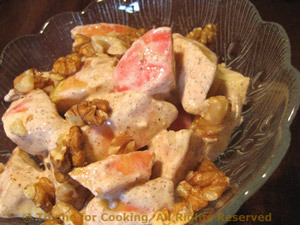 Turn heat up to medium-high and keep adding milk, a little at a time and whisking. You should have added all of the milk in a minute or 2. When all of the milk is in bring to a boil (should almost be there), whisking. Then remove from heat. Remove any tough stems from the spinach and wash. Drain well. Cover and bake 400F (200C) for 20 - 25 minutes, or until noodles are tender. Test in center with a sharp knife. Check the lasagne - if done uncover, bake 5 min.